This seems to me to be a very sensible way of dealing with a harsh climate. Unfortunately in Britain we have neither the common sense nor the fortitude of the people of Toronto. 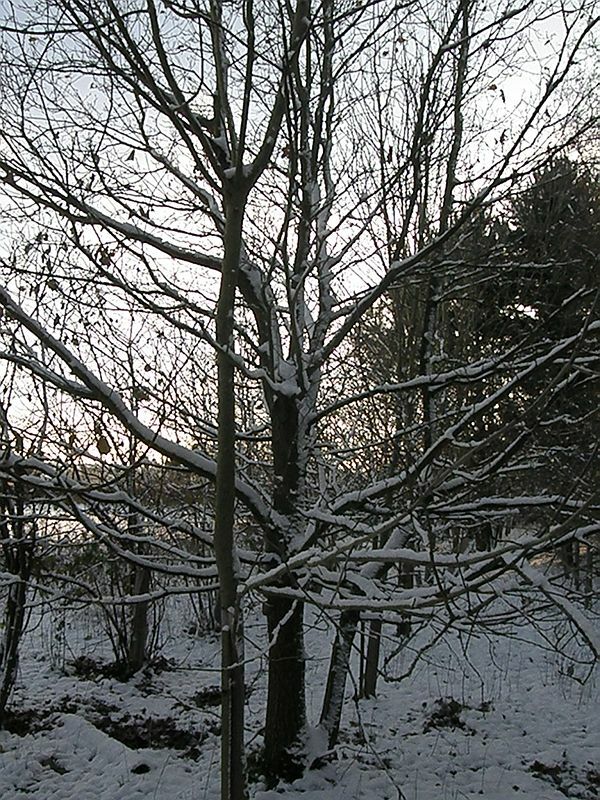 The South East of England received 10-20cm of snow this week and, predictably, everything ground to a halt. I don’t know whether all the stressed-out workers are looking for any excuse to take a day off or whether we’ve lost any sort of self-reliance, but either way it’s a pretty poor show. And me? I love snow. I like nothing better than getting out and exploring after a decent fall of snow, and since I became interested in tracking I like it even more. Tracks in the snow offer a real window into what’s been happening, what animals have been out and what they have been doing. Naturalists have used all sorts of techniques to record the movements of wild animals, from radio transmitters to long pieces of string. A couple of inches of snow will do the same job in a much more interesting way. On Saturday I wrapped Scarlett in her warmest clothes and headed out. I couldn’t take her too far, but we had a nice walk around the fields. Long enough for me to show her the common tracks in the area. 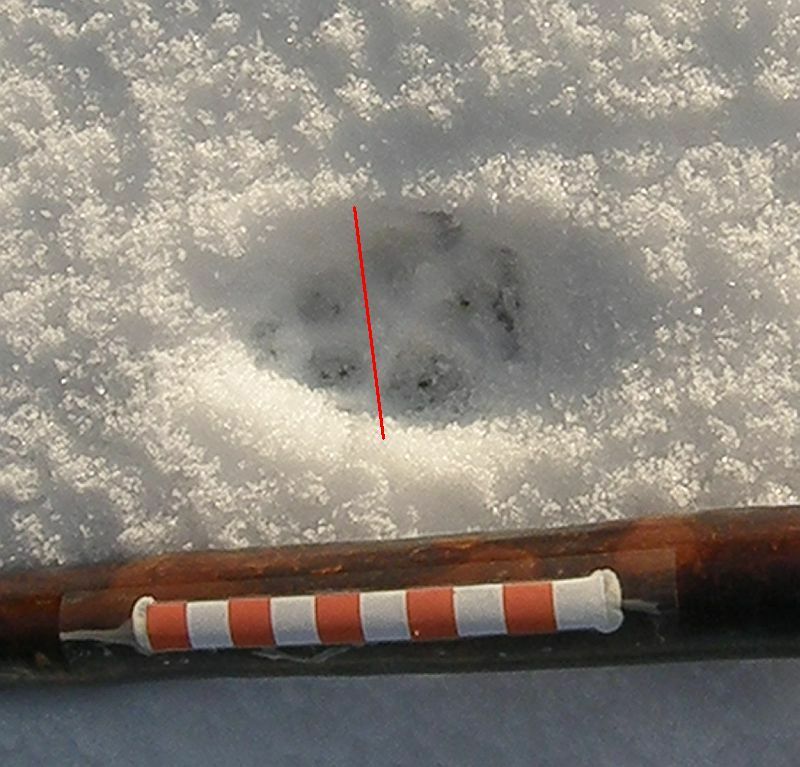 Here’s the most common – rabbit tracks. Every now and then I come across someone who says they’ve found strange and enormous paw prints, but what they’ve seen is not the marks of giant toes but the tracks of all four feet of a rabbit. Which way was the rabbit travelling? That’s right – left to right. There seemed to be a lot of fox tracks around. We live in an area where there is a lot of rearing (and shooting) of game birds, so foxes are not exactly popular. We used to see far more of them when we lived in London. Fox tracks are small, neat and diamond-shaped, with four toes and a heel pad. Notice how the small heel pad forms a straight line at the back of the track, almost like a straight bar. It can be easy to confuse fox tracks with those of dogs. Most dog tracks are broader than fox’s, with the toes more widely-spread. The heel pad is usually larger too. However, dogs come in all shapes and sizes. Some dogs are bigger than others. The tracks of small, terrier-like dogs can look very similar in shape to fox tracks. The way to tell them apart is the spacing between the front and rear toes. Look at the fox track again. The front toes are forward of a line drawn across the ends of the rear toes. In a dog, the front toes overlap with this line. Another quick way of telling fox and dog tracks apart is to look at the trail – the series of tracks. Fox trails always seem to be very purposeful. Foxes seem to walk in a straight line, one track in front of another. The tracks have a direct register, in other words the fox puts its hind feet into the tracks of its front feet. To the novice, it can look as if the fox is walking on its hind feet like a human. Dog tracks, on the other hand, don’t quite register, so you’ll get front and rear tracks close to each other but not quite overlapping. Dogs don’t seem to have the same sense of purpose as foxes – dog tracks will often meander around as the dog wanders this way and that. With a bit of practice you can tell dog tracks from fox tracks without having to look closely at the individual prints. The temperature hasn’t risen much above freezing all weekend, so hopefully the snow will last for a while yet. That suits me fine. Tracking in snow is absolutely fascinating. Put it this way, if I lived in Toronto I’d happily venture above ground to spend months tracking the local wildlife. Hi Badgerman, i was just wondering i can’t seem to find on your website the times of year where the badger comes out at a certain time. So just a quick question, around this time of year, what time at night do they come out? Been trying to identify animal tracks on the recent snow. Your pics and posts v. helpful. Could you tell me what the scale is that you use in your pics – and do you have pics of hare tracks? Thanks for getting in touch. 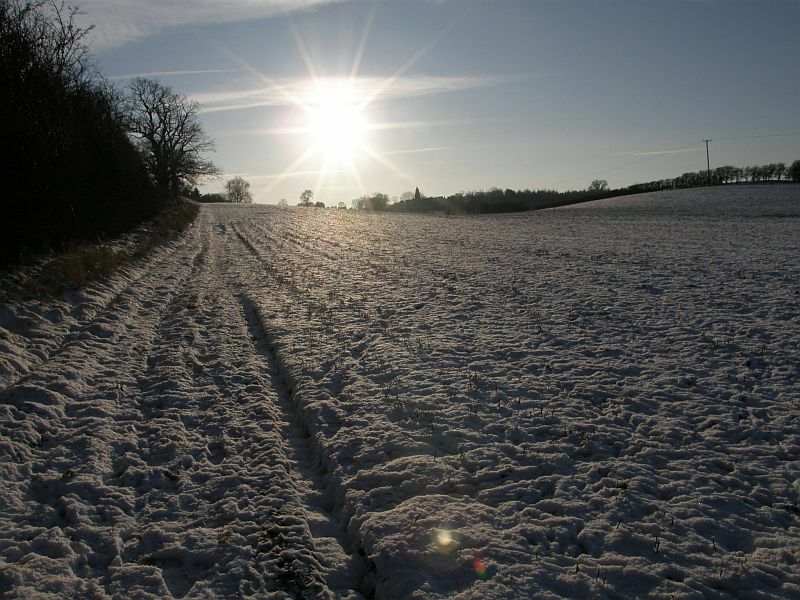 I’m glad you found the site useful, and glad to hear that you’ve been out and about looking at tracks in the snow. 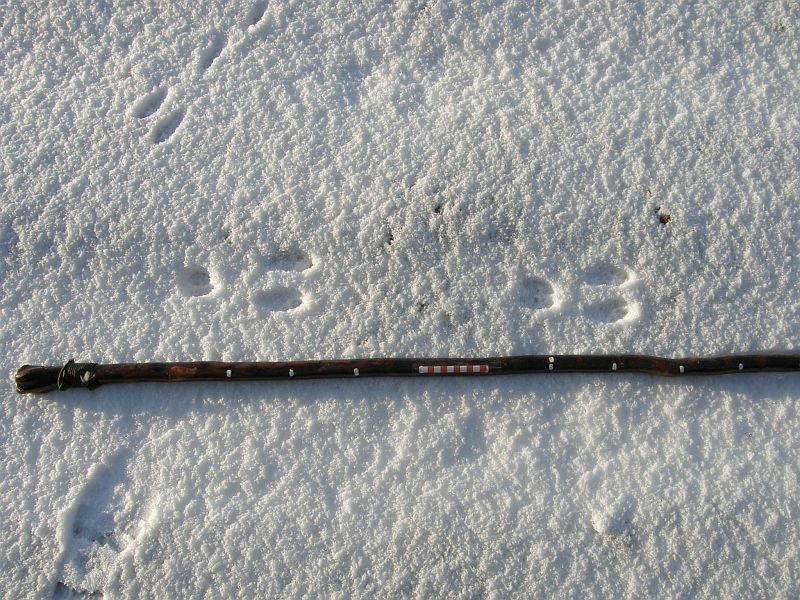 To answer your question, my tracking sticks are marked in 10cm intervals with spots of white paint. I use these for measuring stride lengths etc. I also use a 10x1cm scale. This is alternate red and white squares. I have these 1cm scales attached to my tracking sticks and another one on a short strip of wood that I keep in my camera bag. Basically, anything that’s a red and white scale is in centimetres. As for hare tracks, I don’t think I have any definite pictures of these (i.e. that I can conclusively say are hare tracks because I saw them being made or for some other reason). I know they are pretty similar to rabbit tracks except larger and with a longer stride (I personally believe that stride length and gait pattern is a surer way to identify the maker of the tracks than looking purely at the footprints themselves). 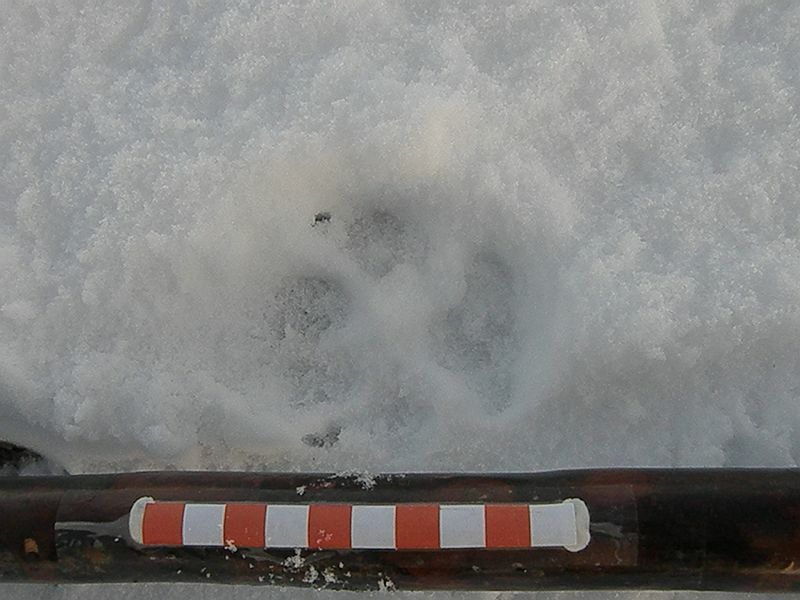 The best I can do is to point you towards https://badgerwatcher.com/2009/01/10/fieldnotes-4th-10th-january-2009-badger-tracks-in-snow/. Have a look at the second picture from the bottom, the one with the tracks circled in red. I think this is a rabbit track, but from the size it could well be a hare. The trouble is that hare (and rabbit) tracks may show great variation in stride length depending on how fast the animal is moving, anything from 25cm to 250cm for a hare. I hope this helps you a bit. If you have any pictures I’d be glad to take a look at them and offer any (very amateur) advice. Hi Joanna – thanks for your comment. I’m glad you found the site useful! Rabbit tracks can be confusing until you work out that it’s groups of four small feet, not four toes on one great big foot. I think the rabbits you get over there are pretty much the same as ours (Cottontails are anyway – I’m not sure about the more exotic US species like the Swamp Rabbit). As to the other tracks, I don’t know. I’d just be guessing. But if you get a picture feel free to send it to me (badgerwatchingman@gmail.com) and if I can’t identify it I’ll post it on here and I’m sure that a more knowledgeable reader will be able to give you an I.D.